Omkaram the word itself creates a divine feeling on hearing. One can feel the supreme sprit of it. 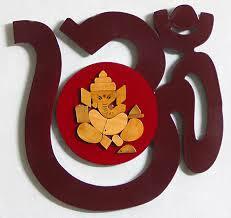 Om is a spiritual symbol (pratima) referring to Atman (soul, self within) and Brahman (ultimate reality, entirety of the universe, truth, divine, supreme spirit, cosmic principles, knowledge). The large bottom curve symbolizes the waking state A. The middle curve signifies the dream state U. The upper curve denotes the state of deep sleep M.
Chanting the divine single word OM creates a spiritual Consciousness in everyone .Being good, doing good always paves a way for the Supreme lord. Uplifts your soul and will increase your spirituality. Try to be as snug and relaxed before you start vocalizing to actually increase your spirituality. Keep your face neutral or happy once vocalizing to realize confidence and wonder – anxiety on your face once vocalizing will cause you to look harsh. Keep the religion – it’s all concerning dedication, therefore keep in mind to concentrate and believe Om once vocalizing it. Believe in what you chant – merely voice communication “Om” can yield no positive results. The silence is simply as necessary because the chant, therefore fancy the cosmic energy when your prayers.